We live in a wonderful world indeed. And in places like Greenland, the skies are wonderful too, full of spectres, ringed glories, sundogs, coronas, lunar halos and cloudbows. These weird atmospheric optical phenomenons are common there. This one is a lunar halo, photographed by Ed Stockard. Here are some more. 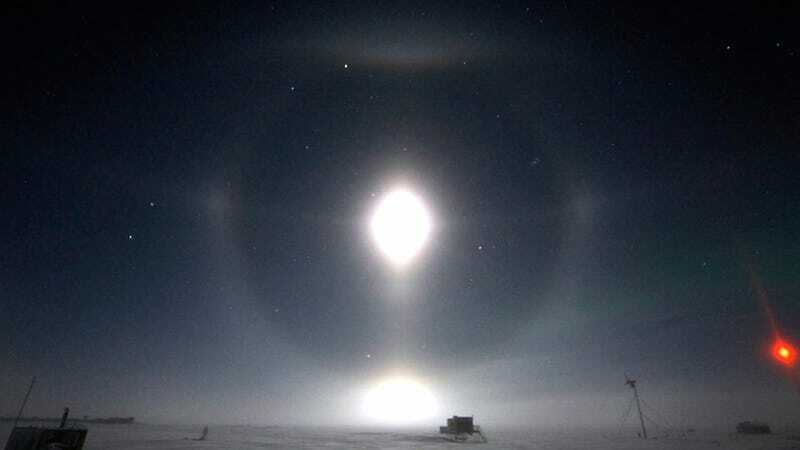 While lunar halos can be seen anywhere where there's ice crystals on the air, it's on the polar regions where they are more usual. Stockard has hundred of photos of these weird phenomenons. These are not caused by the camera lens' optics. They are real and anyone can see them with their naked eye. For over a couple hours the sky changed as halos, arcs and sun dogs came and went. Some described as frequent and some described as rare. In this photo is a washed out lower tangent arc, a 22 degree halo with sun dogs, upper tangent arc along with a parry arc. Also is the second halo or 46 degree halo and circumzenithal arc. The large halo that surrounds the sky is the parhelic circle with 120 degree parhelion (little sun dogs I think). And real faint I believe I am seeing either a Wegner arc or maybe a Hastings arc. This is a corona, also shot by Stockard. A corona is a diffraction optical effect generated by a "a thin fog of supercooled water droplets." The light gets scattered out on spherical waves that overlap with each other. When the different waves' crests match perfectly, they cross each other out, producing darkness. This is a Ringed Glory and a Broken Spectre combined, taken by Vincent Lowe. Vincent's shadow is projected into the suspended water particles, while the Ringed Glory frames it.